The 1947 World Series featured a much-anticipated matchup between cross-town rivals. The powerhouse New York Yankees were making their 15th appearance in the Fall Classic while the Brooklyn Dodgers, a club that had dominated the early days of Major League Baseball, were enjoying a post-war resurgence. Thanks to a groundbreaking athlete named Jackie Robinson, this Fall Classic was especially significant for reasons that would have long-lasting societal implications. Earlier that year, Robinson had broken the baseball color line when the Dodgers started him at first base on April 15. After a phenomenal season, he was named National League Rookie of the Year. But it wasn’t easy. Early in the season, Robinson faced opposition from his teammates, a barrage of racial epithets from opponents’ managers, players, and fans, and even violent targeting on the field. Robinson overcame all of those incredible obstacles and by season’s end found himself on the game’s largest stage in the nation’s grandest city. In Game 1, he became the first black athlete to play in the World Series. 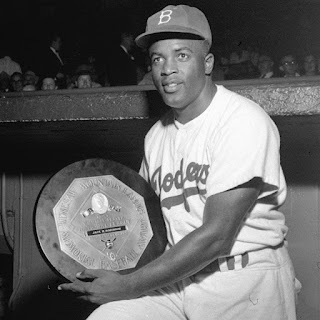 Then, in Game 2, Robinson once again made history as the first black player with a base hit and an RBI in the MLB championship. Those big moments, however, likely would not have happened without the foresight and spiritual guidance of Dodgers General Manager Branch Rickey. Known for making decisions based on his knowledge of the Bible, Rickey believed that God had afforded him this influential position, in part, so that he could help desegregate professional baseball. He simply needed to find the perfect athlete to join him in the fight. “I’m looking for a ballplayer with guts enough not to fight back,” Rickey famously told Robinson. And that’s what Robinson did throughout the 1947 season leading up to the World Series and those first two games where he further etched his name in history. The Dodgers ultimately lost Game 2 10-3 and the Yankees won the series in seven games. But the real winner was Major League Baseball and the entire nation. Robinson went on to win the 1949 National League MVP award, appear in six All-Star Games, and win a World Series title with the Dodgers in 1956. He was inducted into the Baseball Hall of Fame, and his #42 jersey was eventually retired throughout the entire league. On the annually celebrated Jackie Robinson Day (April 15th), every Major League athlete, coach, and manager dons that number in honor of one of the game’s true legends. And thanks to his following the wisdom of the Sermon on the Mount, Robinson did even more for the game of baseball and the many athletes that would ultimately follow in his sizeable footsteps. Dear Lord, we thank You for those who stand true and strong on Your word. Help us to study Your word and base our life on it. I the Name of Jesus, Amen. Don’t hold on to grudges, hold on to grace. Are we stressed or blessed? Are we looking for God or just looking godly? Hatred will destroy our relationships. Are We Salt & Light, or Just Salty & Lit? God favors those who choose to rely on Him.